The episode “Regrets Only” from Modern Family is hilarious – especially because a huge fight that Phil and Claire have that sets the tone for the whole episode is about (unbeknownst to Phil) a Wedge Salad. 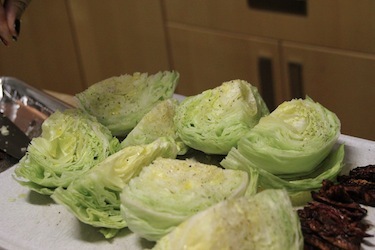 When we watched this, I realized I had never actually had a Wedge Salad before – I didn’t really understand why anyone would want to eat a big hunk of iceberg lettuce, even if it had blue cheese crumbles and dressing on it. 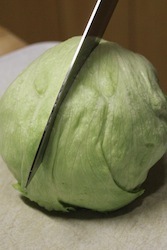 A wedge? Hmm. 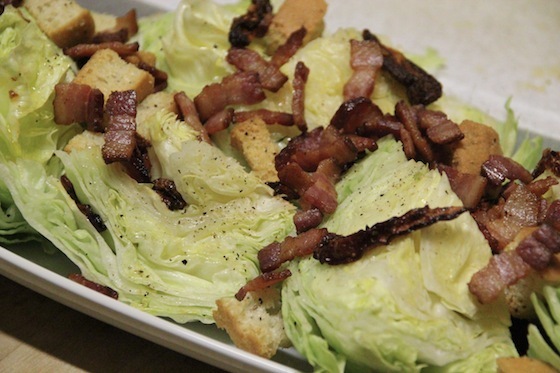 Well, Nick made his special monthly dinner for me a few days ago, another awesome Ad Hoc at Home-inspired meal, and part of it was Thomas Keller‘s take on a wedge salad, with slices of Iceberg lettuce instead of wedges. It was delicious. Tonight for Tuesday Night Dinner, I decided to make Wedge Salads for the girls, following Chef Keller’s recipe, just keeping the “wedge” part instead. 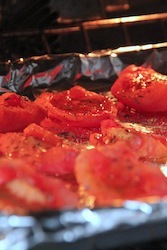 First, I had to oven-dry some tomatoes (like sun-dried, but at home in your oven). I quartered and peeled them, drizzled olive oil and sprinkled salt and pepper over them. 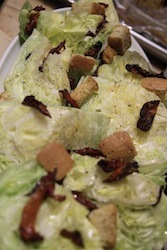 I sliced the dried tomatoes, and then sliced a few heads of lettuce into wedges. 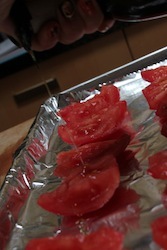 Then, I drizzled olive oil over the wedges, and sprinkled salt and pepper over them. 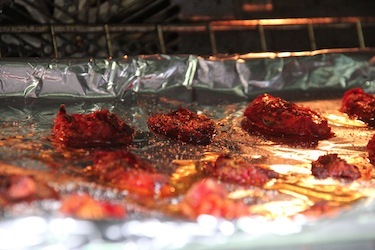 And finally some bacon that the girls had fried up and sliced for me (thanks, Woo sisters!). YUM. 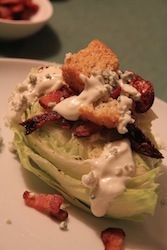 Oh man, was I wrong about Wedge Salads. I think they’re one of my favorites now! When you eat most other salads, even though the leaves are torn or small, they’re still not “bite-sized”. You have to fold them over with your fork, or if you’re in a fancy place, use your salad knife (thank goodness) to cut them. 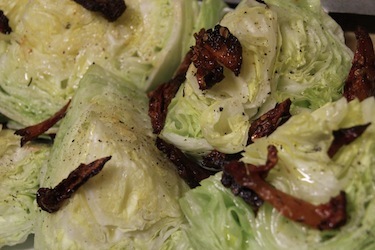 With a Wedge Salad, you’re already using a knife and fork, so every bite is the size you want! And I thought having all that Iceberg lettuce in a mass like that meant that the dressing doesn’t flavor the salad enough. Not so! Each bite of Iceberg is a nice, refreshing burst, and you determine how much dressing you want on each piece. 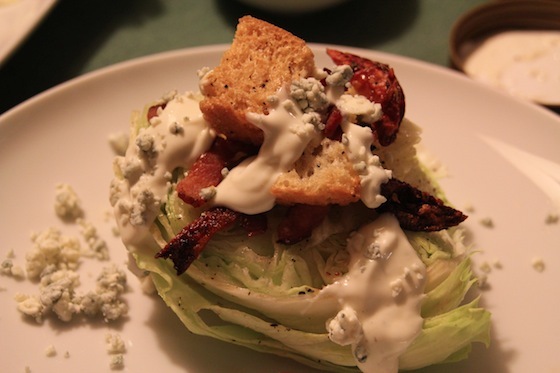 If you’ve never had a Wedge Salad before, you should order one next time you go out … or make one yourself! 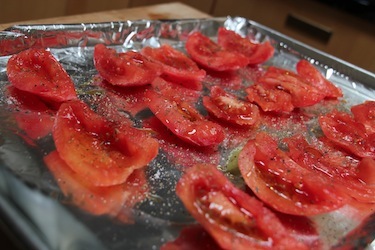 You don’t have to oven-dry your tomatoes – you can get sun dried, or just use fresh (which is more common anyway). 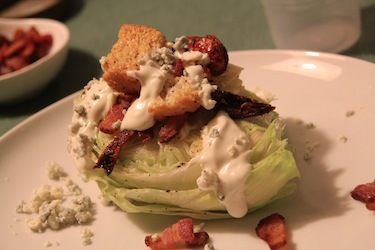 All you need is a head of Iceberg, some blue cheese dressing and crumbles, tomatoes, and bacon. It’s so easy … and it’s SO GOOD.